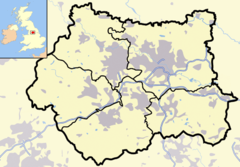 Guiseley is a small town in the City of Leeds metropolitan borough in West Yorkshire, England. Situated south of Otley and Menston, it is a suburb of north west Leeds. At the 2001 census, Guiseley together with Rawdon had a population of over 21,000. The A65, which passes through the town, is the main shopping street. Guiseley railway station has regular train services into Leeds, Bradford and Ilkley on the Wharfedale Line. The settlement predates the Domesday Book. Its name is of Saxon origin. It was named "Gisele" in the Domesday Book. Much of the Aire valley was once wooded, and "ley" means a clearing in the woodland. Guiseley's church dedicated to St Oswald was the centre of a large parish that included many surrounding villages. It was used by generations of the Longfellow family. Henry Wadsworth Longfellow's grandfather left here for the New World in the 18th century. The rector of St Oswald's for several decades was Rev. Robert More (died in 1642), the father-in-law of the English explorer, Captain Christopher Levett. Patrick Brontë and Maria Branwell were married at St Oswald's and became the parents of six children, including Anne, Charlotte and Emily Brontë. The town is famous for Harry Ramsden, whose fish and chip shop traded from a small shed next to the tram stop. In 1930 he opened "the world's biggest fish and chip shop". The original restaurant was closed in December 2011. The Wetherby Whaler group purchased the site and planned a £500,000 refurbishment to open during the summer of 2012. The new Wetherby Whaler restaurant opened on 22 May 2012. Harry Corbett, famous for his children's television glove puppet character Sooty stage act, lived with his parents, who owned a fish and chip shop on Springfield Road. Guiseley has two retail parks: Guiseley Retail Parkbin the centre of town, and Westside Retail Parkbbetween Guiseley and Yeadon. The town has a Morrisons supermarket, charity shops and beauty stores on the High Street, as well as many pubs, bars, takeaways and restaurants located around the town and a leisure centre with swimming pool and gym on The Green. Many of the retail outlets in the town are now stood on the converted sites of old factories or mills. Recently, the town has seen an increase of 'big name brands' opening stores in the area, with names such as Argos, TK Maxx, Marks & Spencer (food), Asda, Currys, Costa Coffee, Comet and Carphone Warehouse opening in the area. McDonald's, KFC and Subway all have stores in the town, also. Victorian actress Adelaide Neilson, born in Leeds, passed the majority of her childhood in Guiseley, where she worked at Green Bottom Mill and was a nursemaid to a local family before she ran away to seek her fortune in London. The former Yorkshire and England cricket captain Brian Close lived in the town during his childhood and still lives there now. Barney Colehan lived in Guiseley until his death in 1991. He is buried in Guiseley cemetery on Chevin End Road. The creator of the famous glove puppet Sooty, Harry Corbett, also lived in the town. ^ "2001 Census Pdf". http://www.guiseley.co.uk/About_Guiseley/Census_2001/Guiseley___Rawdon_Census_2001.pdf. Retrieved 20 September 2010. ^ "First Harry Ramsden's chip shop bought by Whaler Group". BBC News. 6 February 2012. http://www.bbc.co.uk/news/uk-england-leeds-16910637. ^ "Home". http://www.aire-wharfecricket.org.uk/. Retrieved 20 September 2010. ^ "Aireborough RUFC". http://www.aireboroughrufc.org/. Retrieved 20 September 2010. ^ "Parkinson's Park website". http://www.Parkinsonspark.co.uk. Retrieved 23 March 2012. ^ "Home - Guiseley School Website". http://portal.guiseley.leeds.sch.uk/default.aspx. Retrieved 20 September 2010. ^ "Aireborough Grammar School". http://www.school-index.co.uk/urn/127985.php. Retrieved 20 September 2010. ^ "Tranmere Park". http://www.tranmerepark.leeds.sch.uk/. Retrieved 20 September 2010. ^ "St Oswald's C of E Junior School, Leeds :: Home Page". http://www.stoswaldsleeds.org/. Retrieved 20 September 2010. "The Ancient Parish of Guiseley". GENUKI. http://www.genuki.org.uk/big/eng/YKS/WRY/Guiseley/index.html. Retrieved 2007-10-29. This page uses content from the English language Wikipedia. The original content was at Guiseley. The list of authors can be seen in the page history. As with this Familypedia wiki, the content of Wikipedia is available under the Creative Commons License.